"The most important thing to us is education," says doctoral candidate Martin Langer, who provided expert support to the team. "The students can participate in a real astronautics project, from the initial idea to the launch into orbit and then the operational mission. On the one hand that means experience which can be used in later projects in industry, on the other it's of course an excellent motivational element." 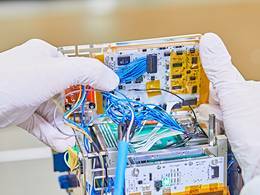 "There are a number of subsystems inside the satellite which constitute new technological territory for us," says Langer, "For example the two transceivers, the satellite's communication systems, where we're using Software-Defined Radio technologies. The transmitting and receiving parameters can be adjusted with great flexibility using the software, theoretically even while in orbit after the satellite has been launched." The satellite is also controlled from the earth with a mission control software and the associated interface, all developed by the students. "We'll test all these systems, evaluate the results and then make further improvements to the systems," says Langer. MOVE-II will remain in space for a maximum of ten years and then will completely burn up in the atmosphere.